GIVE IT YOUR BEST SHOT – If the property has received multiple offers, you are now competing, so you need to go strong to have a shot at winning. Unfortunately, “normal” negotiations are out the window on multiple offers—it is the time to go hard or you may not be getting the home. Go in with a simple, yet strong offer—because you may only get one shot at it. The price is the single most important part of an offer—a lowball offer may not even get read through all the way. Do not assume that they will counter or call for highest and best offers. However, there are several ways to make an offer more appealing, such as: raising the amount of earnest money deposit, reducing the length of option period for inspections, loan pre-approval, reducing or eliminating seller concessions or repair requests and a faster closing date. Often none of the offers are perfect offers, so tweaking a few items may result in being the offer that is picked. CONSIDERATION – As they say, “time is money,” and it is definitely true in real estate. 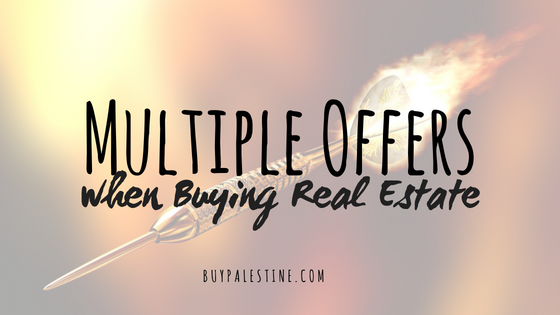 The closing date, the length of the option period, the ending dates for contingencies—all involve timing, and in a multiple offer situation you want to nail it on the timing! Sooner is usually better—but what if it wasn’t? What if there was something you could offer to tip the scales in your favor that wouldn’t be a big deal to you? It’s not always possible, but considering the seller’s needs and priorities (if the situation is known) may just be the key to separate your offer from the others. For example: Mr. Z is selling his home to move out of town and needs a fast sale so he can move in time to start his new job. However, his new house won’t be ready for 30 days. Moving time and coordination is an issue for this seller and he may prefer to accept a lower priced offer with a 2 week closing with a 2-week leaseback before moving vs. a full price offer with a 45-60 day close date. You never know…the most important item to them may not even matter to you! Lisa E. Priest loves good advice and is a Texas Real Estate Broker with Picket Fence Realty, Inc. You can reach her via phone or text at 903-948-3343 or read more at BuyPalestine.com.